Listen MPR News host Tom Weber spoke with Enbridge's Lorraine Little and Tara Houska, National Campaigns Director, Honor the Earth. Each day for decades, five pipelines have quietly pumped more than 2 million barrels of Canadian crude oil below northern Minnesota's forests, lakes and rivers to refineries around the Upper Midwest. It's a network that for years saw little public scrutiny. The lines were built in an era with no federal environmental law requiring studies or public hearings, keeping opposition to a minimum. Those days are gone, replaced by a massive multi-year permitting process that requires transparency and public input — and an environmental movement determined to make its voice heard. 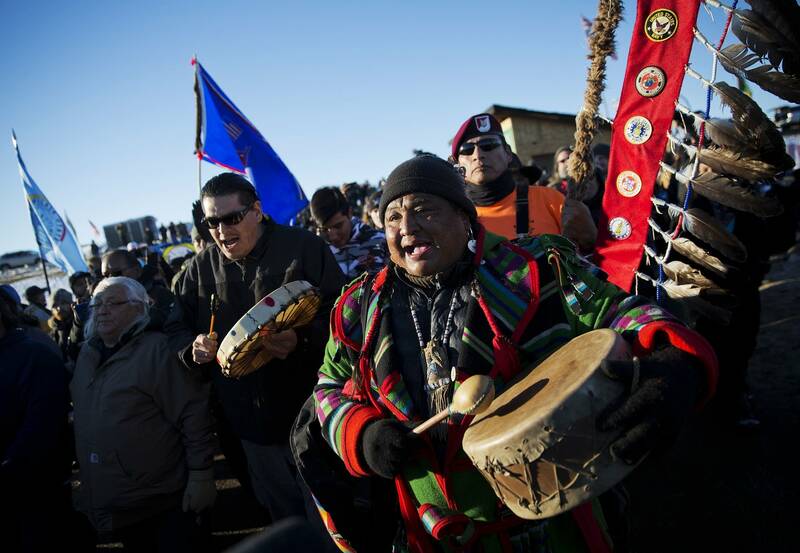 That was never clearer than last year when what began as a small protest over the route of an oil pipeline near North Dakota's Standing Rock Reservation mushroomed into a monthslong international incident. Protesters ultimately lost that fight after Donald Trump became president. Many of those same activists, though, are focusing now on Minnesota where Enbridge Energy hopes to build a new pipeline to replace its aging Line 3. Activists are pressing Minnesota officials now to deny the permit and kill the project. State officials and company executives working to head off a confrontation say they're doing more than ever to listen to the concerns of those in the pipeline's potential path. "If that permit is issued, you can be sure you will have Standing Rock in Minnesota. I will tell you that," White Earth tribal member and Honor the Earth executive director Winona LaDuke said prior to one of 22 public meetings state regulators recently held across northern Minnesota. "We've been very clear with the state representatives, and the governor of Minnesota, that if they approve this line, there will be tens of thousands of people in Minnesota." Those protests drew international attention. Thousands of tribal and environmental activists set up protest camps that were occupied for months. Dozens were injured in clashes with police. There are similarities between the Enbridge proposal and the Dakota Access line in North Dakota. They both travel very near current Indian reservations, and in both cases potential spills could do significant harm to important natural resources. The Dakota Access line travels underneath the Missouri River, from which the Standing Rock Sioux Tribe draws its drinking water. Line 3 would travel through the ancestral land of several Ojibwe tribes, where they hunt, fish and most importantly gather wild rice, a central part of traditional diet and culture. There are also significant differences, both in how the process for approving the pipelines has played out, and in efforts of the tribes, the state, and Enbridge to engage in that process. In North Dakota, while the tribe did voice its concerns to the company building the pipeline early in the process, it did not engage in the 13-month public process, said Julie Fedorchak, a North Dakota Public Service Commissioner. "There was just an awful lot of public input, unfortunately one of the entities that did not participate was the Standing Rock tribe," she said. "So we had no idea when the tribe came back after we approved it that they had any concerns at all." Contrast that with Line 3. Not only are Native American activist groups like Honor the Earth involved, but four tribal governments have formally intervened early in the proceedings. "I think that's very important to establish the groundwork," said Joe Plumer, an attorney representing two of those tribes, the White Earth and Red Lake Nations. The state is more involved, as well. State agencies did not adequately consult with tribes about the Sandpiper pipeline, Plumer said, a separate project that Enbridge ultimately dropped last year after it invested in the Dakota Access pipeline. "Now all of a sudden, the Minnesota Department of Commerce has pulled almost 180 degrees from that earlier position and has reached out to the tribes," said Plumer. "Whether or not that will translate into meaningful action ... that remains to be seen. " Enbridge has also taken some cues from the Standing Rock protests. "I think what we're doing now that's different is just increasing the capacity in our organization to engage," said Paul Eberth, who directs the company's Line 3 replacement project. "We're working hard to respect the sovereignty of the tribes and the rights that they have both on and off reservation, and make accommodations in our project to do that," Eberth said. The question is, will those accommodations be enough to appease opponents who say the pipeline poses too big a pollution risk to the lakes and rivers of north central Minnesota, and would add to the effects of climate change? 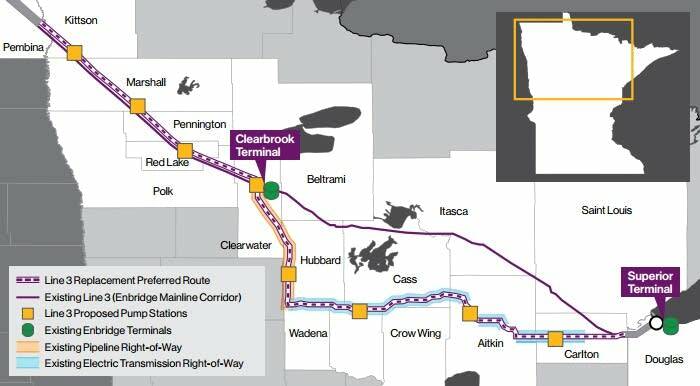 A big sticking point could be Enbridge's plan to decommission the existing Line 3, leave it in the ground, and build a new line along a different route, south of the existing pipeline corridor. That's a non-starter for White Earth tribal member Bill Paulson. "If they proceed to move forward and try to enter another corridor with this pipeline, I will be personally up on the line," he said. "And anybody that wants to join me I will take care of them and help them get there also." Paulson has started a camp on the White Earth reservation he calls Camp Turtle Island. He said nine people are living there now who oppose the pipeline or who want to learn about Ojibwe culture. If a new pipeline is to be built, he said, he wants the old line removed and cleaned up, and a new one put in its place. "I think that would be the bare minimum of anything that I would even consider being agreeable." Enbridge argues that removing the old line would actually create more environmental and safety risks, because it's located only 10 to 15 feet away from other operating pipelines in the company's mainline corridor, which currently carries 2.9 million barrels of oil every day from Canada. "The use of 50-60 ton excavating equipment around the live pipelines to remove Line 3 poses an inherent integrity and safety risk to the active pipelines, as well as to the environment, construction workers, and the general public," said Enbridge project director Barry Simonson. In Bemidji, Minn., tensions are already running high, even though any decision on the pipeline isn't expected until next spring. Last December Enbridge halted a meeting after protesters disrupted it. In February shots were fired at the front door and windows of Enbridge's office in town. "I just feel there's a middle ground we can reach," said Beltrami County commissioner Jim Lucachick. "We don't have to be doing drive-by shootings or screaming and yelling at other people. It just doesn't make for a good environment." The next attempts at finding that middle ground will occur this fall, when more public hearings on the pipeline, this time in front of an administrative law judge, are scheduled. The Minnesota Public Utilities Commission expects to issue a final decision on the pipeline next April. If it's approved, the company says the pipeline could be operating by the end of 2019, assuming it's not disrupted by protests. 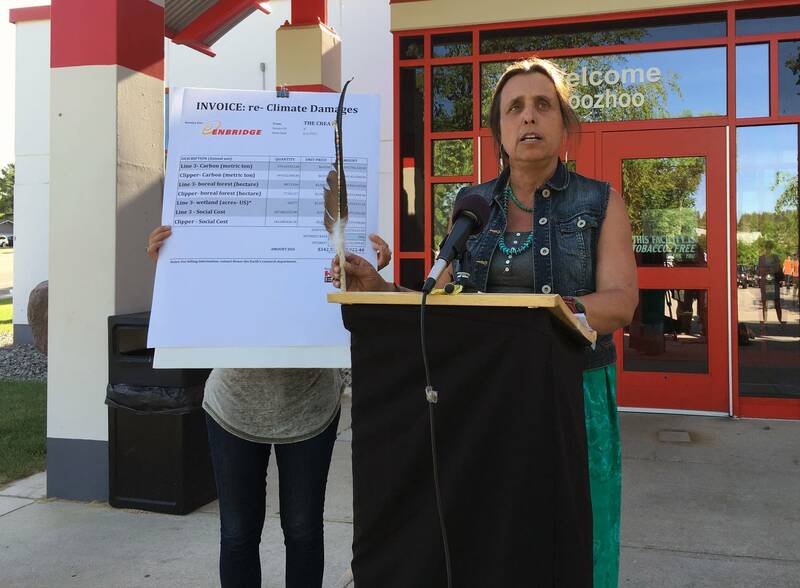 "Enbridge is threatening the destruction of my way of life," said LaDuke. "Enbridge is threatening my people. So I am standing to defend them." Line 3 is an oil pipeline operated by the Canadian company Enbridge. It transports crude from the Alberta tar sands region in Canada across northern Minnesota to Enbridge's hub in Superior, Wis. It's part of Enbridge's Mainline system, a group of six pipelines that together carry about 2.9 million barrels of oil across the state. Why does Enbridge want to replace it? Because it's old, requires increasing maintenance, and isn't operating at full capacity. The pipeline has been operating for about 50 years. It's become corroded and cracked in places, requiring 950 excavations in the past 10 years. To maintain safety Enbridge has had to reduce the line's capacity to 390,000 barrels of oil per day. The company's proposed new line could carry up to 760,000 barrels per day, and potentially even more. Most of the oil passes through Minnesota to refineries around the Upper Midwest. About 400,000 barrels per day are diverted to two refineries in the Twin Cities. The current Line 3 runs at a diagonal from the northwest corner of the state, through the Leech Lake and Fond du Lac reservations, to Superior, Wis. The company's preferred route for its replacement line follows the existing Mainline to Clearbrook, Minn., but then cuts south to near Park Rapids, and then turns east to Superior. The proposed replacement line would travel 340 miles in Minnesota, about 60 miles longer than the current line. Why is the proposal so contentious? 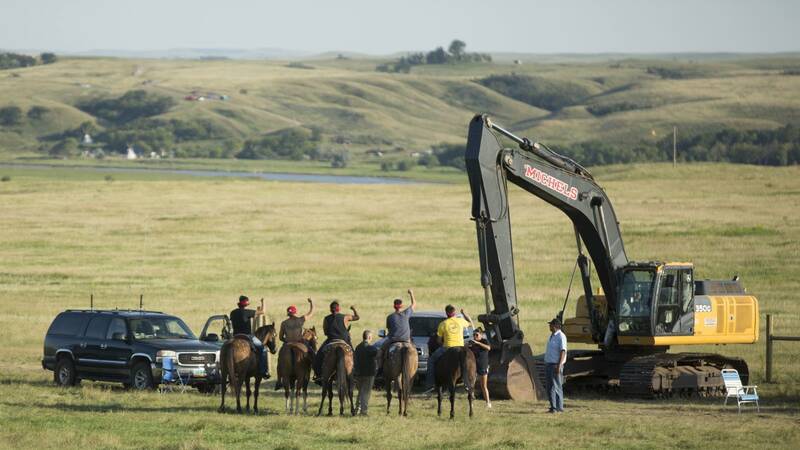 Several tribes, environmental and landowner groups oppose the pipeline for varying reasons. They argue the risk of a major spill poses too great a threat to lakes, rivers and wetlands in north-central Minnesota, including the headwaters of the Mississippi. Tribal members fear potential impacts on the ceded territory where they have off-reservation rights to hunt, fish, gather, and harvest wild rice. Many oppose the creation of a new pipeline corridor. Many also oppose Enbridge's plan to leave the current pipeline in the ground. They say if a new line is to be built, the company should have to remove the current line and clean up any left-over pollution. What has Enbridge done to try to alleviate those concerns? The company has added staff to better reach out to tribes and other communities to try to address their concerns. It recently modified its preferred route to avoid a wild rice lake important to the White Earth Nation. But it's a balancing act. For example the company says it created a new pipeline corridor for Line 3 in part because of requests from the Leech Lake and Fond du Lac Ojibwe bands to not place a new pipeline on their reservations. But other tribes object to the new route. Enbridge says removing the current line would pose safety and environmental risks because in many areas it's only 10-15 feet away from other pipelines in the corridor. The public comment period ends on July 10, 2017. State regulators will release a final environmental impact statement on the pipeline in August. Then an administrative law judge will hold hearings on the proposal in a court-like process, and make a recommendation to the state Public Utilities Commission next February. The PUC plans to make a decision in April, 2018. If it's approved, Enbridge has said a new pipeline could be operating by the end of 2019.